At $799 and $899 respectively, Google’s Pixel 3 and Pixel 3 XL are the most expensive phones Google has ever made, and arguably also the best. But on Thanksgiving and Black Friday, you might be able to get $400 off either Pixel 3 — and you might be able to do it without chaining yourself to Verizon or trading in your current phone. You see, Verizon is offering that $400 off a number of flagship phones over the next two days, including the Samsung Galaxy S9, S9+, Note 9, LG V40, and the two new Pixel phones. With Verizon’s deal, you’ll only see that savings over the course of two years. Mind you, it’ll still be a Verizon Pixel 3, meaning you’ll need to activate it on Verizon and pay a $30 activation fee before you can unlock the phone. 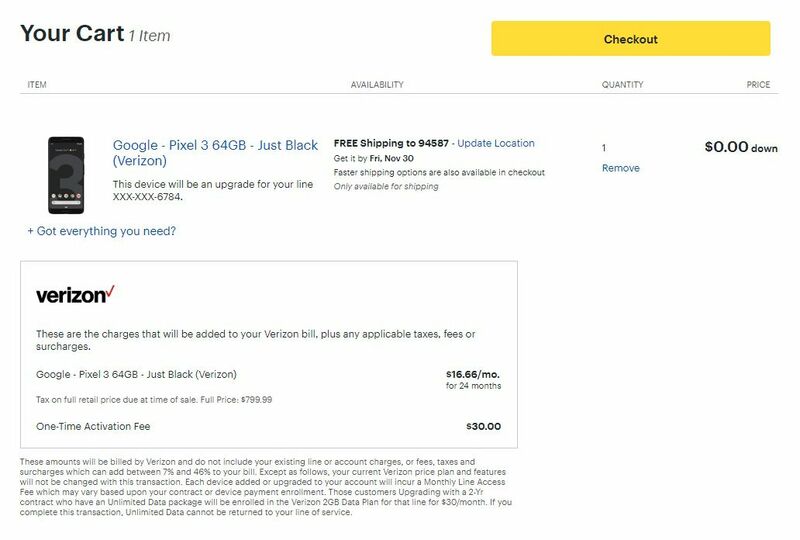 If that’s too much of a hurdle, Google is also offering the pre-unlocked Pixel 3 for $150 off, and the Pixel 3 XL for $200 off starting on Thanksgiving as well. Update, 12:05 AM ET: The deal is now live, and I just bought one myself! I can confirm the contract I signed is basically a loan for $400 in total (because I bought the cheapest model) and the terms say I can pay it back in full at any time. I paid $78 in tax, will be paying a $30 activation fee, and then $16.66 a month gets tacked onto my Verizon bill unless I pay it off early.